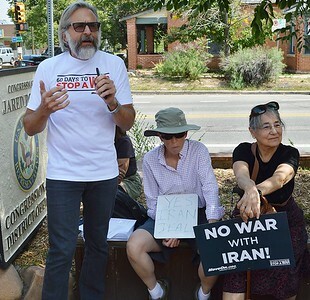 Protesters gathered outside Rep Jared Polis' district office to urgr him to support the nuclear treaty with Iran. 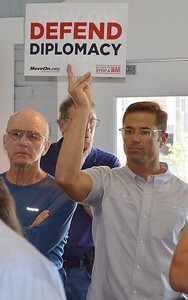 The group later entered the office and spoke with the Congressman's staff. 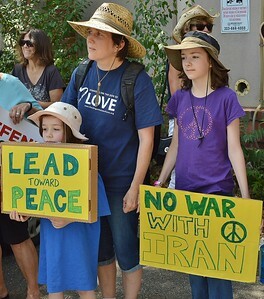 Mother standing with two young daughters both holding signs supporting treaty with Iran. 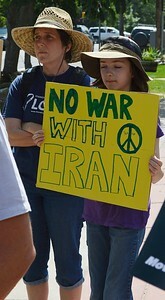 Young girl holding sign "No War With Iran"standing next to her mother, in foreground another woman holding similar sign. 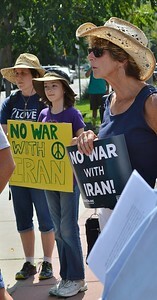 Young girl holding "No War With Iran" sign, her mother next to her. 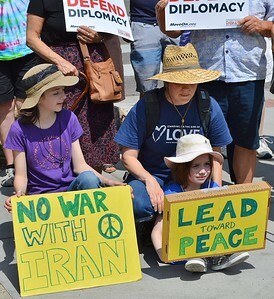 Mother wearing straw hat sits with two young daughters, both holding signs supporting Iran treaty, other demonstrators standing behind them. 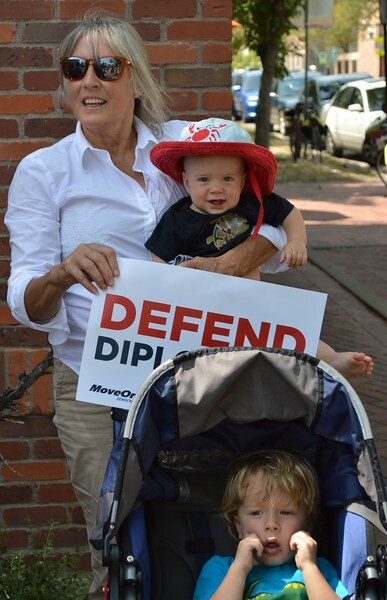 Mother holding young child and "Defend Diplomacy" sign, other child sits in stroller. Mother holding young child and "Defend Diplomacy"sign, in front of them, another child in a stroller sitting with legs crossed, in front of stroller sign about supporting Iran treaty. 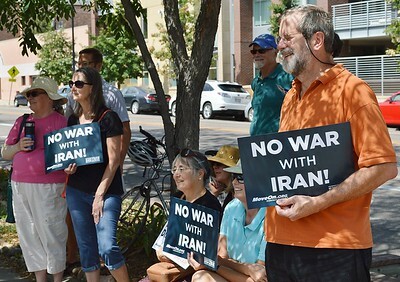 Group of demonstrators holding "No War With Iran" signs. 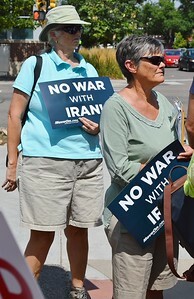 Two women holding "No War With Iran" signs listening to a speaker at protest. 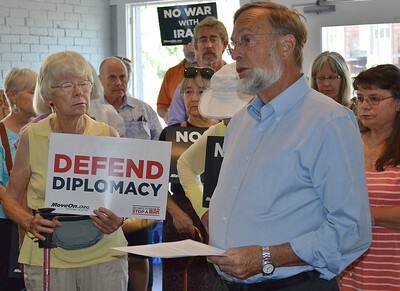 Man with beard,holding papers in his hand speaks while group of protesters with signs supporting Iran treaty listen in the background. 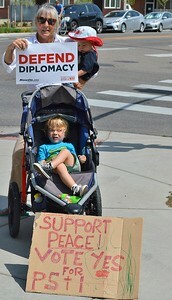 Man raises "Defend Diplomacy" sign above his head at protest for the Iran treaty. Man raises "Defend Diplomacy" sign above his head at demonstration supporting Iran treaty, other demonstrators around him. 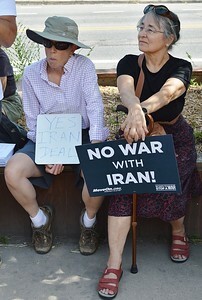 Women sitting on bench holding cane and sign "No War With Iran". woman with similar sign next to her. 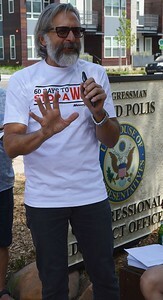 Man with grey beard, wearing "60 Days To Stop A War" t-shirt speaks at protest, other demonstrators sitting next to him with anti war signs. 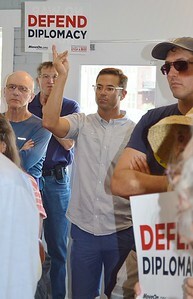 Man with grey beard, wearing "60 Days To Stop A War" t-shirt gestures with hand while speaking at protest, behind him sign for Representative Jared Polis' office.